I love this place. 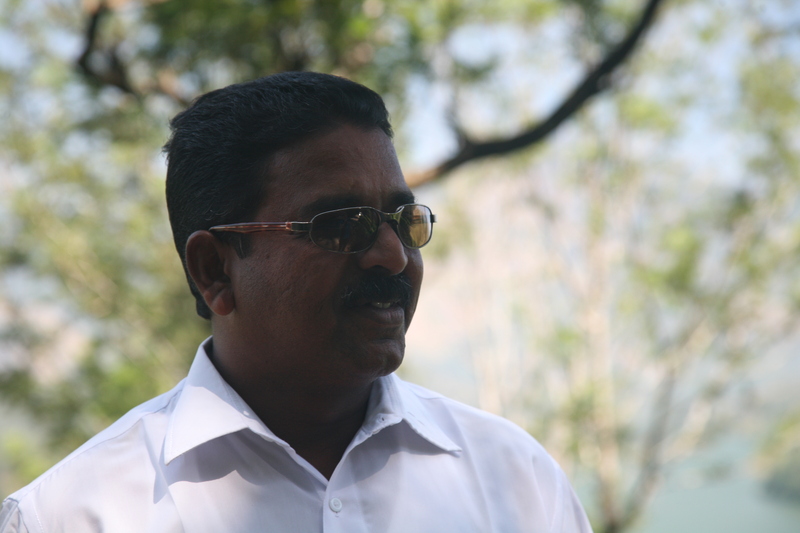 Mohan, our trusted driver these past few weeks travelling slowly through South India, told us Kerala was “God’s Own Country.” I understand now why he couldn’t wait to show us his home state. 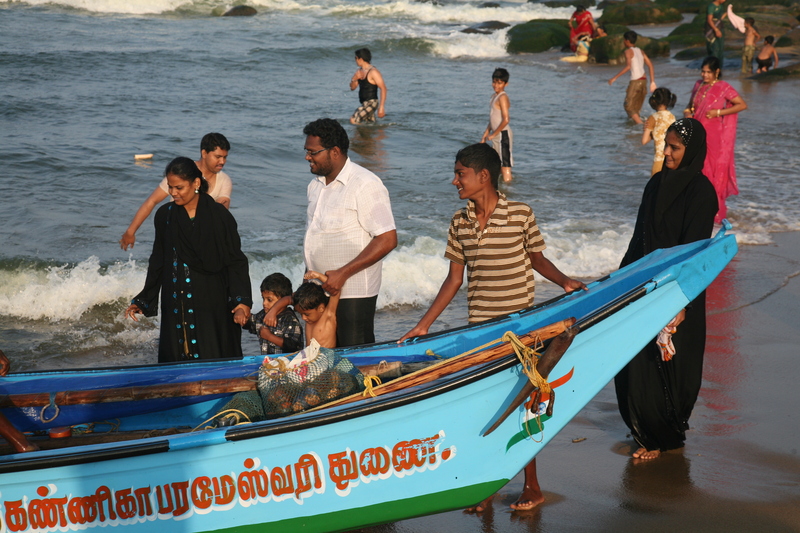 Kerala means land of coconut in Malayalam, the local language. But Kerala is not only about coconut. It’s tea plantations, hills, backwaters, beaches along the Arabian Sea and Mohan’s favourite, “Kerala Fish Curry.” He has it almost every day with thali, a creative compilation of small tasty local dishes. Traditionally thali’s served on a banana leaf. Wholesome and inexpensive thali includes Kerala brown rice, vegetables, chutney, yoghurt and pickle.What better place to learn how to make Mohan’s fish curry than Cochin or Kochi as it has recently been renamed – it ‘s been a centre of fishing and trading in India for centuries. Today a visit to Hindu temples, mosques, churches and a synagogue tells the story of Kochi’s long history. With a population of about one and a half million, it is not the sleepy port we first visited in 1994. At that time we could hear explosions off the coastline. “Dynamite.” We were told then. “For fishing.” The illegal dynamiting has been stopped but the renowned Chinese fishing nets in Kochi now “are mainly for catching tourists,” our guide tells us. I’m glad the fishing nets are still there. 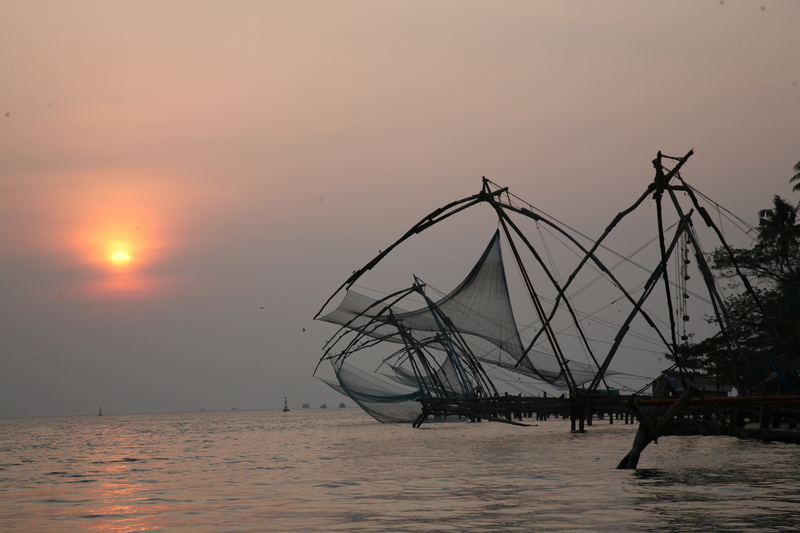 They are a beautiful reminder of the past and a way of living in Cochin. 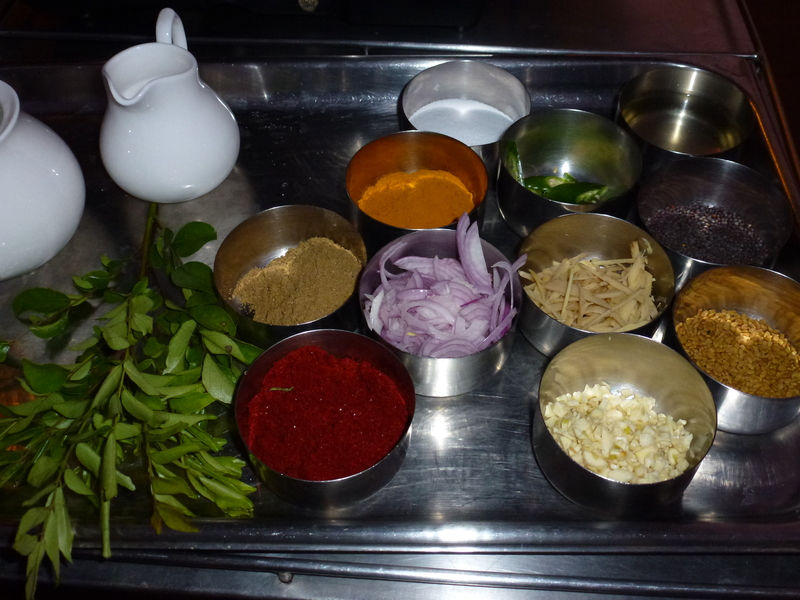 Many of the chefs in the small hotels we are staying in South India are pleased to share their recipes and happy to help make changes to avoid allergens, even the much-loved coconut that is in every “Kerala” dish. 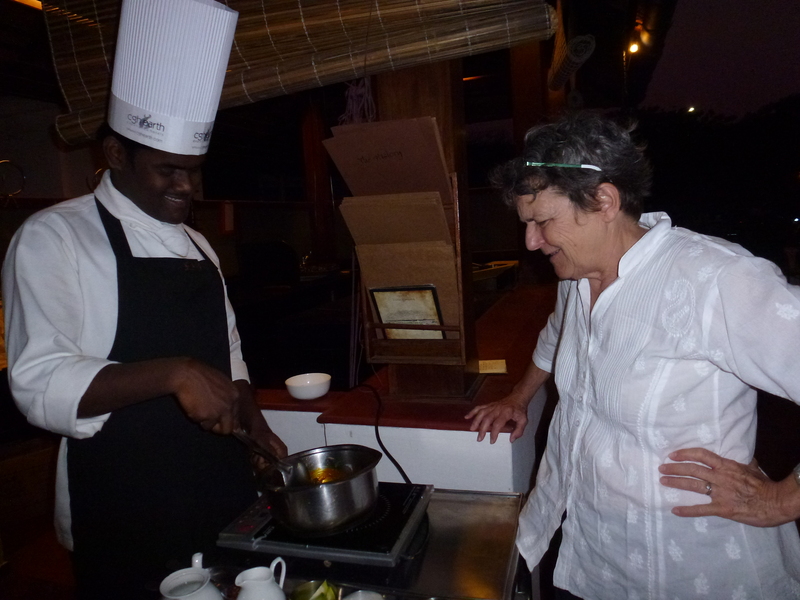 Chef Kardhik at Brunton Boatyard Hotel near the fishing nets taught us how to make fish curry. I’ll make it at home and maybe post the recipe. We left out the Kerala and substituted cream. Delicious. Like most things in this beautiful part of India. 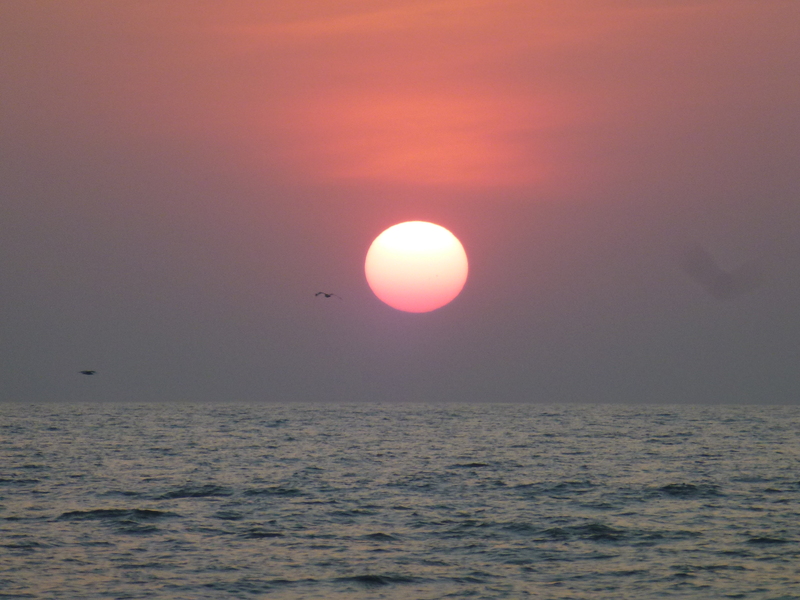 A Beach of Two Tales: Guest Post by Ross Hayes. Architect.Urban Planner. 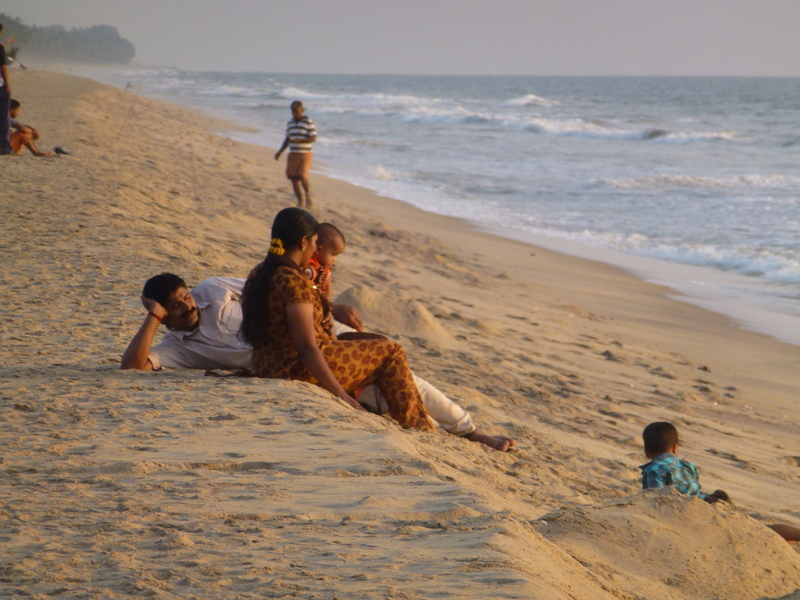 We had been in India for two days staying south of Chennai (Madras) at Covelong. Exploring the beach, in one direction I happened upon a fishing village, which appeared to have evolved from centuries of tradition. In the other direction, I saw high-rises, India’s response to its emerging role in the world’s high tech community. The contrast could not have been more vivid. To the right, I make out faint silhouettes of fishing boats, people moving and the blocky outline of a village smothered in palms. I set out to explore it. I expect hopeful little voices saying, “pen please, where are you from,” but the children are preoccupied with a game of leapfrog interrupted by a dash to the shore to greet incoming fishermen. A long open boat surfs the waves as it approaches and it is skilfully turned broadside at the beach. Two fishermen jump out and with a long pole between them, sling a heavy motor off the stern and march it up the beyond the high tide line. 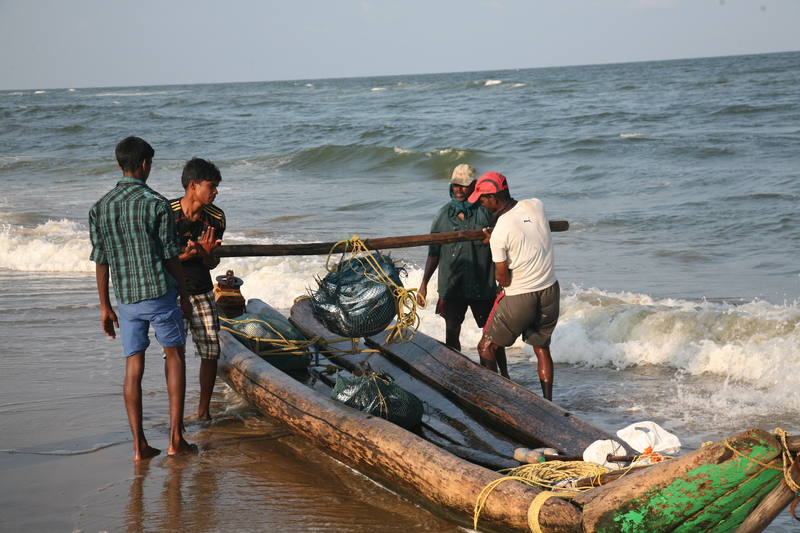 Then they quickly return to the boat to hoist off two bales of fish as the faces of enthusiastic onlookers light up with the sight of the catch. I walk further into the crowd. 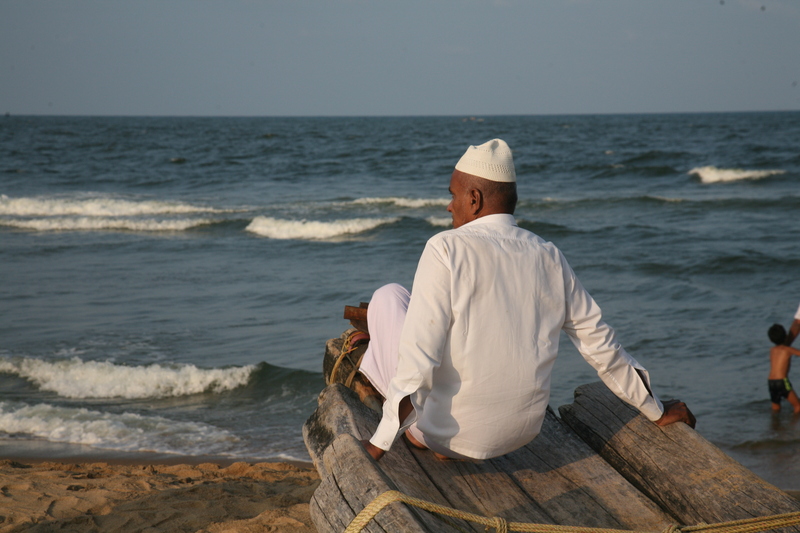 An older gentleman wearing a dhoti with a white embroidered cap sits cross-legged at the bow of a boat and gazes into the horizon. I can’t begin to guess his thoughts, but his calmness suggests a satisfaction that this time the sea has been good. Not far away, a group of women with young children sit on an old boat. They indicate they want me to take their picture. They laugh, shout at their kids to be still and flash broad smiles at the camera. Their red forehead markings and large gold earrings glisten. 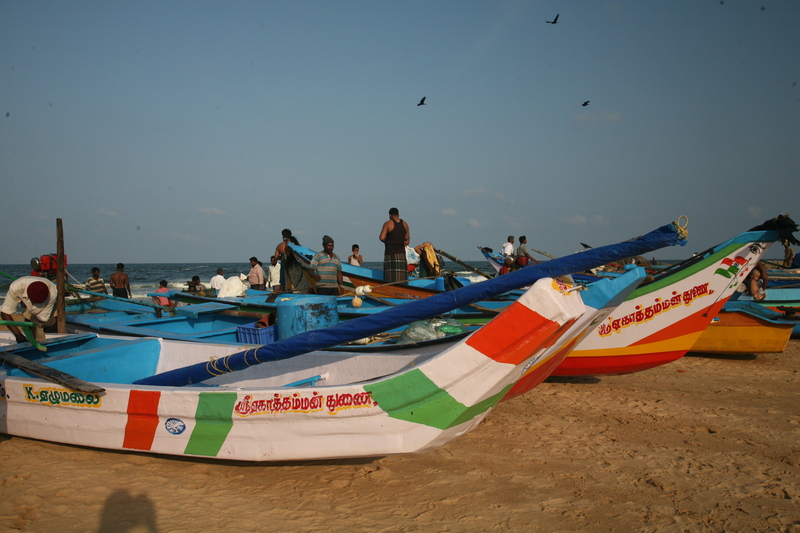 Their colourful saris flow down to the sand. And then thank me! I thought I should be thanking them. Close by an informal market is set up. Women sit on the sand, spreading out banana leaves in front of themselves to display the catch. There are long silver fish, glistening in the afternoon sun and mounds of shrimp. Smaller fish remind me of children’s drawings, shaped by two intersecting curved lines with a dot for the eye. 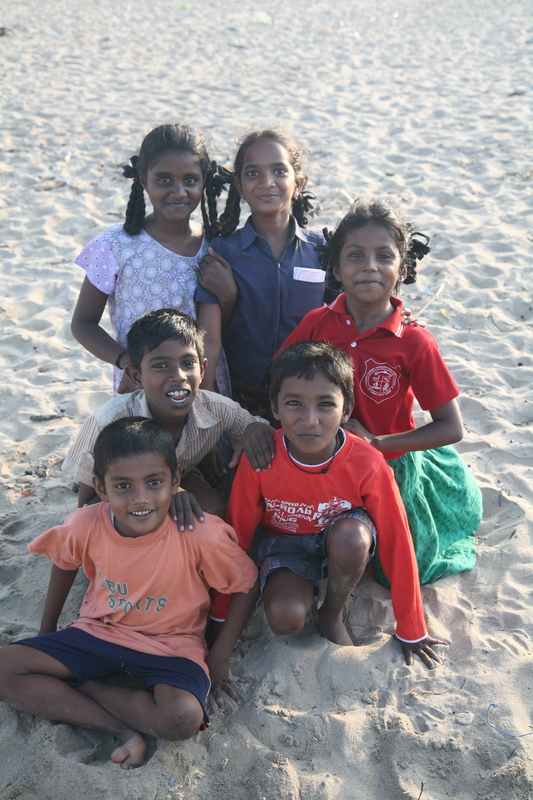 Down at the beach, a group of kids chase a floating red ball. Two Moslem women join in the fun and plunge into the surf, fully clothed in their long back robes. 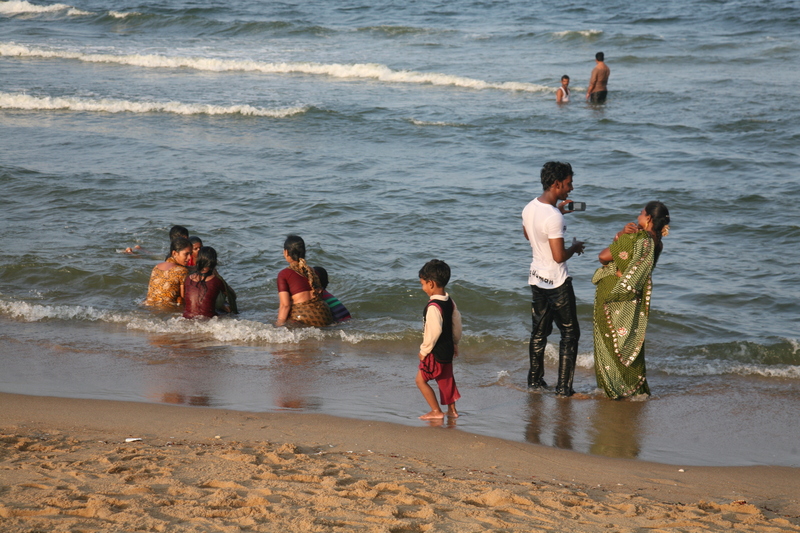 Three sari clad Hindu friends, who are also being soaked and tossed about in the surf, cheer them on. A few metres away fishermen are repairing nets, carefully sewing stone weights into the bottom edge to prepare for another day and hopefully another celebration. Later on I walk to the left of our cottage. I have seen activity there, but I don’t know exactly what’s happening. 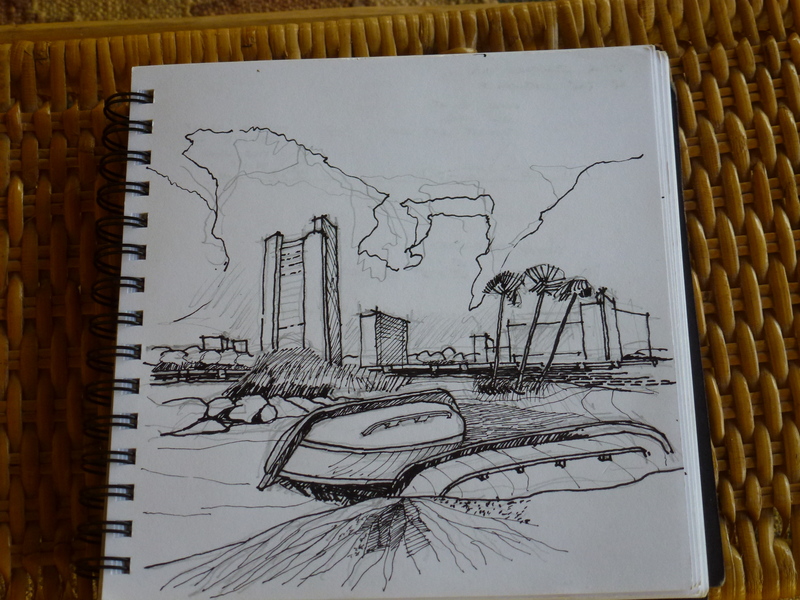 I move along the beach past two abandoned fishing boats. A river flowing out to sea blocks my way and then I see a young man who parks his bicycle in the shade of the trees. My eyes follow him as he strides across the sand flats and swims across the river with his net across his shoulder. The current sweeps him toward the open sea. But I see he’s done this. He finds a perch in the sand below him before he casts his net. I watch for a moment before I see an unexpected skyline. A series of high rises of 15 to 20 storeys are visible. These are the new-gated communities, forced out of Chennai (Madras) by the inability of the city to cope with its new 24/7 high tech industry-world. Shops have now taken over sidewalks. People are squeezed into the road with bicycles, motorcycles, three wheel motor rickshaws, cars, trucks and thick black exhaust. Add into the mix delivery vans, construction debris and an occasional cow. The result is chaos that grinds everything to a halt. I can taste the pollution. The sound is deafening. I am told that the city has grown four-fold in 15 years. Within an hour’s walk I had found a beach of two tales – a community intricately shaped by a way of life that is centuries old and another community that has exploded from the force of a new industry.